Forgot the admin password on Windows 8 UEFI/GPT computer? Most of password recovery bootdisks won't boot normally any more when dealing with UEFI BIOS. PCUnlocker should be the unique bootdisk which is fully compatible with UEFI/GPT computer. It enables you to reset lost Windows 8 password with a UEFI bootable CD or USB drive. There are three editions of PCUnlocker: Standard, Pro and Enterprise. But only the Enterprise edition supports UEFI booting. 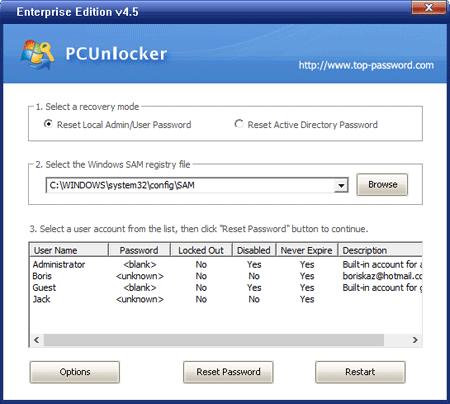 In this tutorial we're going to show you how to reset lost Windows 8 UEFI password using PCUnlocker Enterprise. After purchasing the full version of PCUnlocker Enterprise, you'll get the download link of PCUnlocker_UEFI_x64.zip. Unzip it and you'll get the UEFI bootable ISO image of PCUnlocker. Burn the ISO image to a blank CD or USB flash drive using ISO2Disc. Connect the CD or USB drive to your locked Windows 8 UEFI computer. Turn on the computer and press a key like F12 to bring up the Boot Menu. The exact key depends on your computer. If you can't find a way to access the Boot Menu, you can either head over to BIOS for changing the boot order: set CD or USB drive as the first boot option. Now the computer will boot from the CD/USB drive. After a while, you'll see the PCUnlocker program itself, which automatically searches your Windows 8 SAM registry file and locates all Windows 8 user accounts existing on your computer. Choose a user account and then click on "Reset Password" button. The program will remove / reset your lost Windows 8 password, as well as unlocking the selected user account in case it is disabled, locked out or expired. Remove the Live CD/USB drive and restart your computer. Now you can log back into your Windows 8 UEFI computer without a password!